Hileman Silver Jewelry now has more color options available for our dinosaur bone jewelry designs. We have always had a variety of red dinosaur bone options, but now we have several choices in grays, a white base bone with reddish spots and some yellow with red accents. We are busy creating new jewelry with these new dinosaur bone colors. 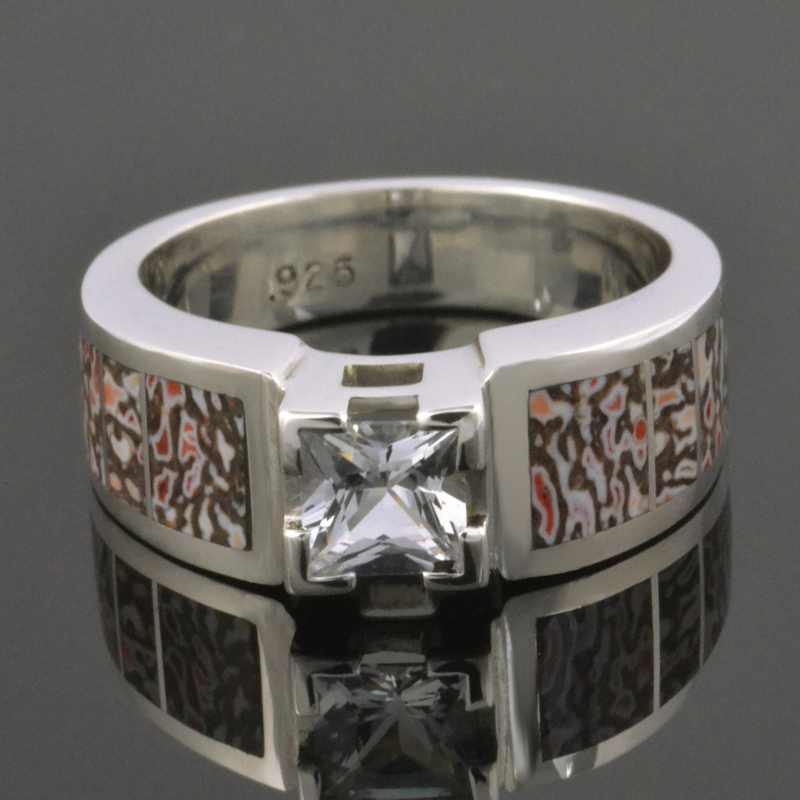 One of our favorite new ring designs is a wedding or engagement ring with a white sapphire in the center and the new white/gray base color gembone with random reddish-orange spots inlaid down the sides. It is a little more subdued than the bold red dinosaur bone but has a very interesting pattern and makes for a very unique wedding ring. You can purchase or read more about this new dinosaur bone ring at our Etsy shop. 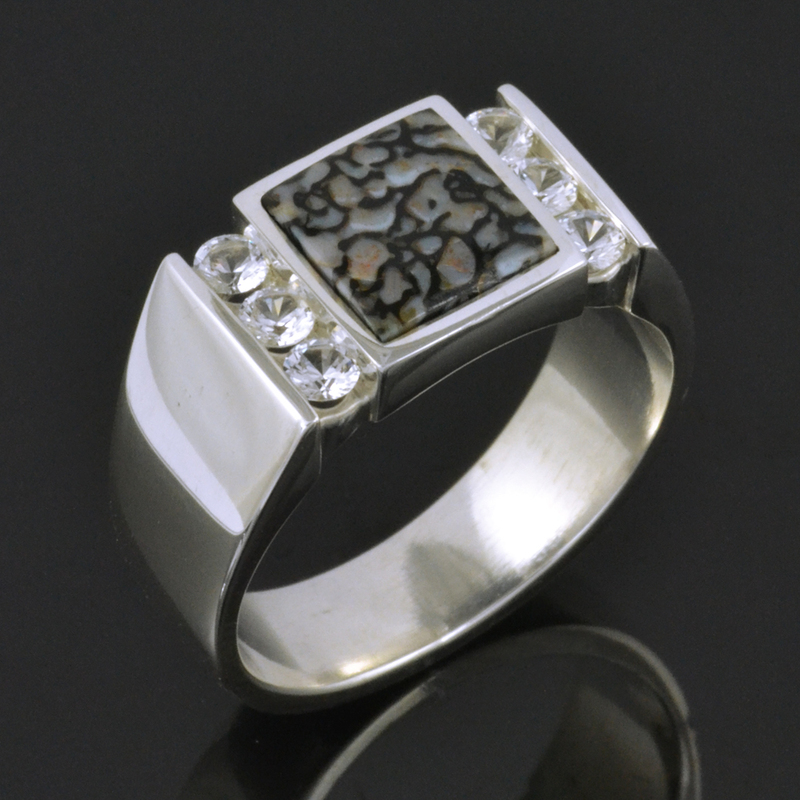 A great example of our new gray dinosaur bone with black matrix is this new man’s ring design. 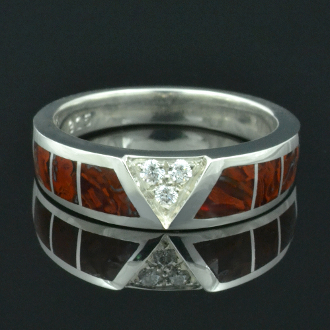 The top of the ring is inlaid with one piece of fossilized dinosaur bone that is slightly raised above the surrounding silver. The bone is a combination of several shades of gray with very distinctive black webbing running throughout. Three sparkling white sapphires are channel set on each side of the dinosaur bone center. This ring will also be available with black diamonds instead of the white sapphires and other materials may be substituted for the gray dinosaur bone. 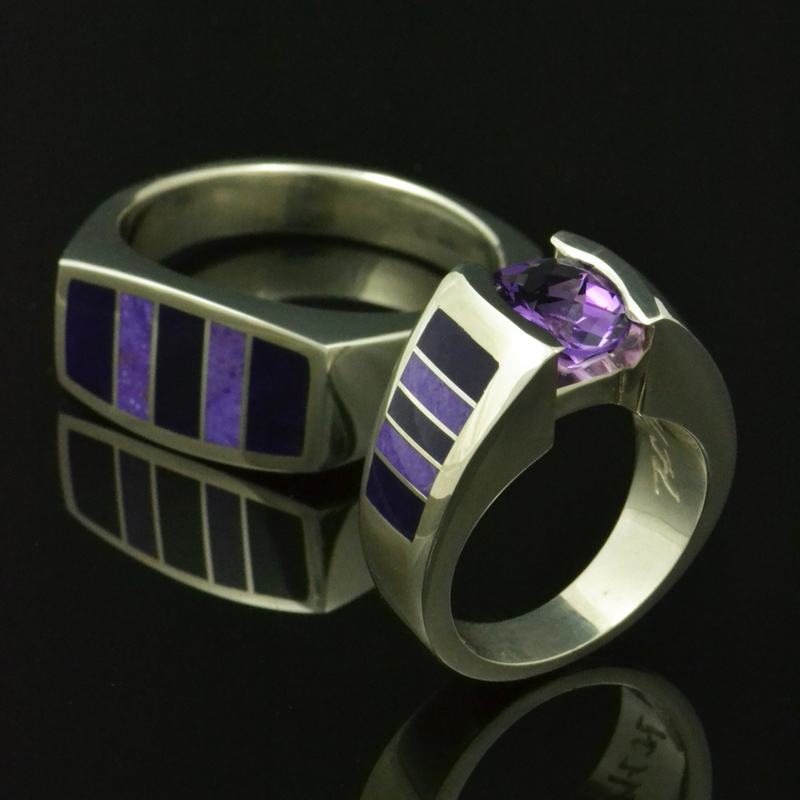 Look for this ring to be listed soon at both our Etsy shop and our Hileman Silver Jewelry website. If you are interested in learning more about dinosaur bone and dinosaur bone jewelry, please read our blog page about dinosaur bone. For detailed information about dinosaur bone, how is it is formed and its metaphysical properties, read this information from BoneMasters.com. 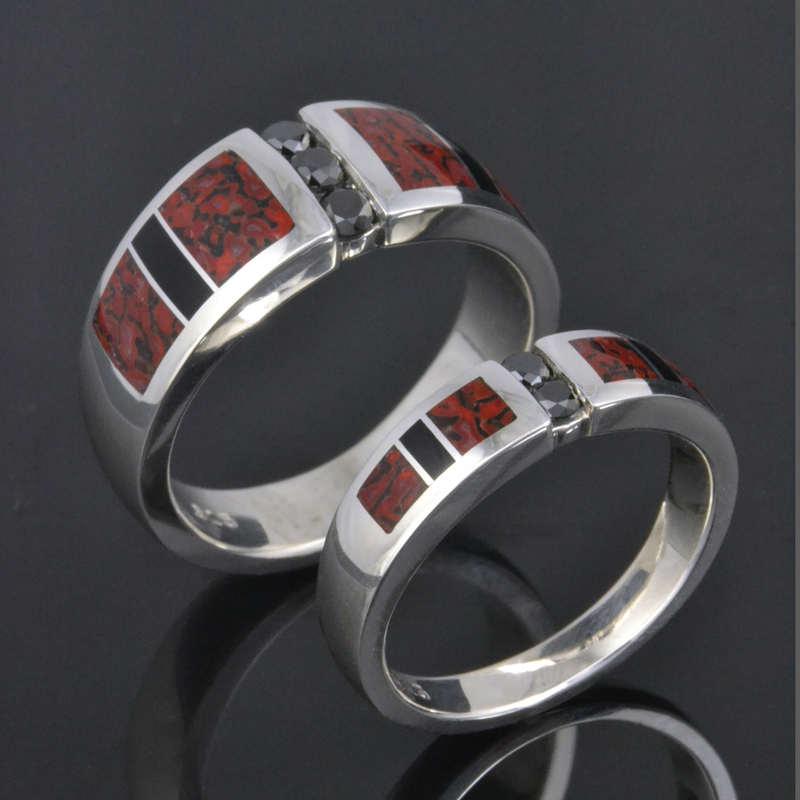 We offer a great collection of dinosaur bone jewelry in a variety of colors and patterns inlaid in sterling silver. To browse our large selection of dinosaur bone jewelry including rings, wedding ring sets, pendants and earrings please visit our Hileman Silver Jewelry website. If you would like to see more photos of our dinosaur bone jewelry, please go to our Flickr page and view our “Dinosaur Bone Jewelry Collection“. 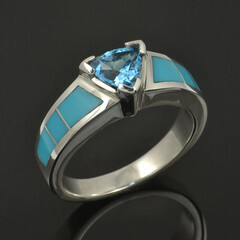 Be sure to follow us on Twitter and Facebook for updated information about sales, new jewelry designs and special offers. Here comes the bride (and the groom)! 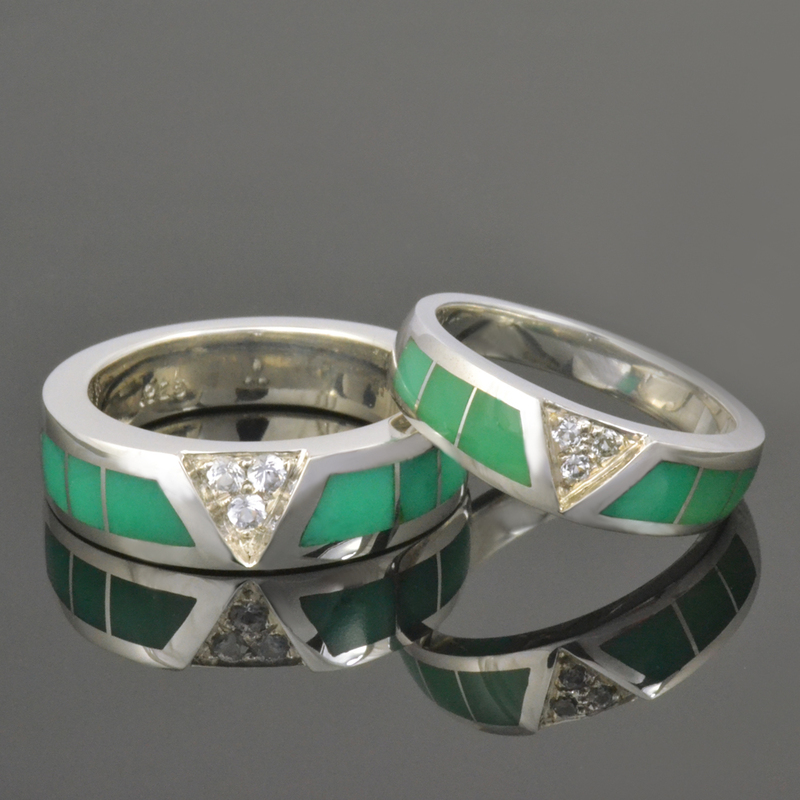 Hileman Silver Jewelry’s focus lately has been on creating an alternative to mass produced, cookie cutter wedding ring sets. We have created several his and hers wedding sets in sterling silver featuring white sapphires, black diamonds and blue sapphires for the center stones. 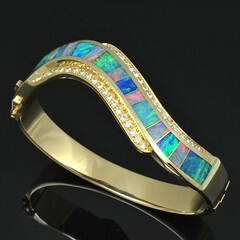 We have accented them with inlaid black onyx, Australian opal and bright blue lapis. So far, the new handmade wedding sets have received rave reviews, so we are working to expand our color palette and introducing a few more style choices. 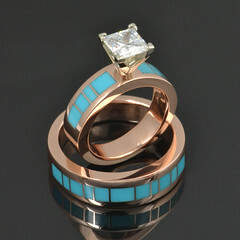 Look for several new wedding band sets to hit our shop page in the next week or two. Buy handmade!